See Infographic below for illustrated explanation of the different packages. See OTHER below for additional fees that may be applicable. Choice of 3 pre-written yet lovely, brief ceremonies provided by Rev. Des. Ceremony selected is as written. Build-your-own Wedding Ceremony from my templates. You receive online access to my extensive collection of ceremony elements, from civil to religious to romantic/literary and a worksheet to notate your choices. Customized ceremony, either co-created between Rev. Des and couple or crafted by Rev. Des (based on your Love Story). Includes access to the Build-your-own Wedding Ceremony collection (see above). 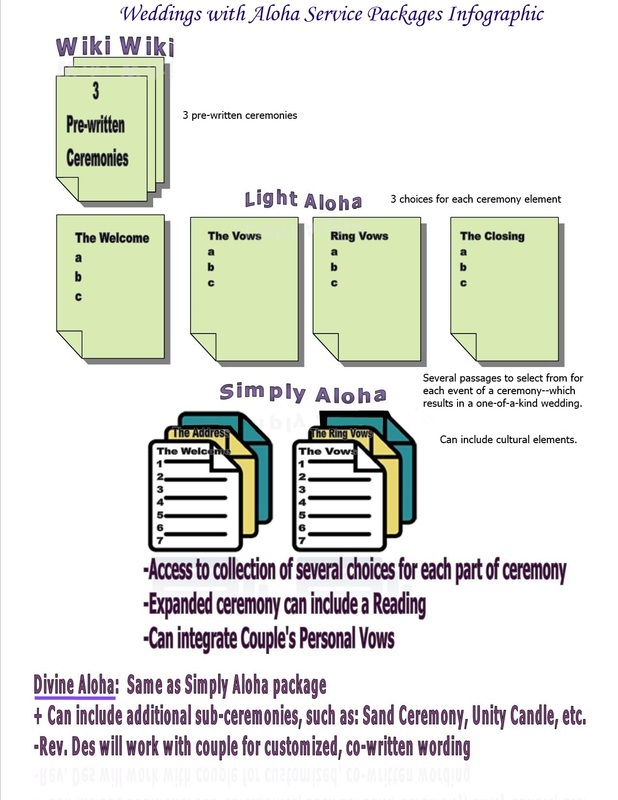 Can include 1 of: Lei Ceremony, Unity Sand/Unity Tree Ceremony, Candle ceremony, Lasso ceremony, etc. $75 Deposit for Wiki-wiki weddings or Renewals. $100 Deposit to Hold the Date for Light Aloha, Simply Aloha, or Divine Aloha packages. Any parking, valet, or entrance fees, etc. needed for ceremony access are to be pre-paid by couple with deposit. Deposit is 50% refundable if cancelled in writing 30 days before date. Small, portable 100W P.A. System. 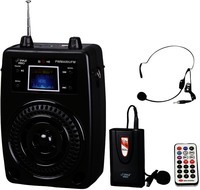 Suitable for small gatherings and especially useful for beachside weddings. Worn by Officiant so that guests may hear the ceremony. I conducted a survey of all the fees for wedding officiants in the surrounding areas (the ones that would publish their prices), and set my rates accordingly in the moderate range. NOTE: Couples purchase their general California marriage license through any County Clerk in California. Both parties are required to apply for the marriage license together, in person with their photo IDs--fees vary per County. You will need 1-2 witnesses to sign the marriage license after the ceremony. For confidential marriage licenses, must be purchased in the same County where ceremony will be solemnized; no witness is needed to sign after ceremony. A valid marriage license needs to be presented to the Officiant for review prior to the marriage ceremony, by law; please bring photo IDs. Newlyweds may purchase a certified copy of their marriage certificate from the same County Clerk after it has been recorded (roughly about 2-3 weeks after County Recorder receives in mail). Fees, rules for ordering, and turn times for certified copies vary by County.